Gene planted green beans this year. Does that make him Gene and the Beanstalk? So far, so good, as the photos confirm. 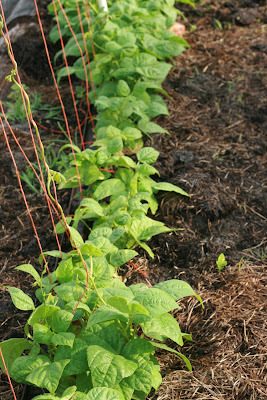 I don't think it will be too long for the blossoms and subsequent beans to appear. I am a bit impatient though, so I bought beans at Costco to try this recipe. My report to you: try it, I liked it. The beans retain some of their crunch; the combination of soy sauce (sweet) and crushed red pepper (hot) give it Asian flair and flavor. *Note-Make sure everything is prepped and ready to go before tossing anything in the pan. It will take just a few minutes to cook everything. It will go by quickly. 1 .Combine the soy sauce, white vinegar, sugar, Sriracha and red pepper flakes in a bowl and whisk until combined. 3. Place the iron skillet over high heat for at least 5 minutes. 4. 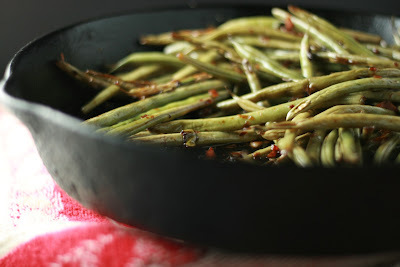 When everything is chopped and ready, toss in the oil, swirl until it coats the bottom of the skillet, and add the green beans. Cook until they are tender, about 4 minutes, stirring every 30 seconds or so. It will look like you’re murdering them, but be patient. It will work. 5. Dump in those neatly cut scallions and shallots and cook about another 4 minutes, stirring every 30 seconds. 6. Add the garlic and cook just until it becomes fragrant; add the soy sauce mixture. Cook for another 20 seconds or so, and then turn off the heat, and plate. Richard, our neighbor, came over for a visit and we provided him a "kit to take home" consisting of spicy green beans and sage roasted potatoes with shallots and garlic, he called early this morning raving about both. Wanted the recipes. 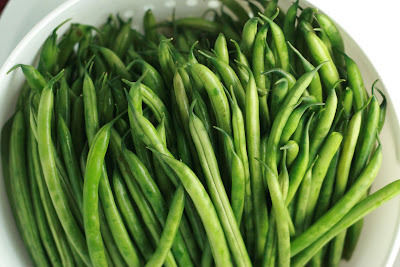 What a tasty way to use green beans! 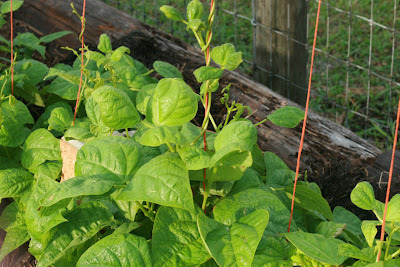 I want to plant some this summer, so I am always looking for yummy ways to use them! finsmom, thanks for visiting and commenting. We did not fence the garden and Gene saw a rabbit there last night. Hope he leaves enough for us too!